Here is the other bulletin that you guys have been talking about,,,,this is a list of the extended warranty on the N20 turbo oil line ,,,,this is the list of cars that are covered,,,,hopefully your cars are covered. I recently received a recall noticed for this problem. Coincidently, my car is showing a wastegate fault. Do you think I would be able to get the dealer to fix the wastegate issue under this recall? Can I make the argument that this flaw caused the turbo/wastegate to fail? OK. Thanks. I BTW, I love this site, keep up the good work. One more question, is it possible to repair athe wastegate without replacing the turbo? Recently (July 2018) our BMW dealer had to change the turbo oil feed line of our BMW 520i (2012 with 82.000 kilometers), due to extreme smoke coming out of the exhaust pipe during cold start after sitting more than one days. We’ve confronted BMW Group (Netherlands) with the documentation on this website and particularly with the extended warranty document (see the posting on this website on August 2, 2018) . BMW Group replies that this extended warranty only applies to N20 engines that were built for the US-market. Therefore BMW Group denies any responsibility in this case. However, I’ve read on this website that in many cases the replacement of the N20 turbo oil feed line was done under the cars warranty. Therefore I was wondering if those replacements were only performed on N20’s for the US-market? Or are there cases known where replacement of N20’s oil feed lines that are built for the (western) European market were (also) carried out under warranty (perhaps a general extended warranty as for the American market)? Great info…is it worth repairing the wastgate vs replacing a new turbo? What’s the cost range for repairing the wastgate vs the cost of replacing a new turbo? I’m just thinking if they repair the wastgate then the turbo craps out 10k miles down the road. Is a bad wastgate an indication the turbo is about to die? Thanks again for the feedback. I opted for a new turbo. I won’t incur any labor cost since they have to disassemble the turbo to fix the recall, I just have to pay for the cost of the new turbo. Do you know if I can rebuild the old turbo to serve as a backup? You probably can have it rebuilt,,,,but I haven’t been able to find the parts to rebuild one yet,,,,I’m sure someone rebuilds them. So, it appears that BMW NA is not extending the warranty for any of the N20’s placed into X1 chassis. I am wondering if there is a difference in the install, or just in the total qty sold and then wealth of the owner that made them decide to just allow the extension for the 3 and 5 series’? I was quoted ~$5k to do the turbo and return line, only 10k miles out of warranty. Any thoughts or guidance?? Just to add a quick question on the “covered” vehicles on the N20 oil line extended warranty bulletin. I just had oil line diagnosed as bad on my wife’s 2014 X1 and they said it wasn’t covered although they are paying for 50% of the cost. I think it should be covered 100% not matter what chassis they put that part in especially if the part was designed with a flaw. Am I wrong? I just discovered this problem with my 2013 X1, 40k miles, about a year out of warranty. I have a call into the dealer to setup an appt, but my initial reaction is that I am not happy that BMW appears to be excluding the X1 on this known issue, especially since it could amount to thousands of dollars in repairs. Jesus – I see you were able to split cost 50% – Any suggestions on how to negotiate with BMW is appreciated. I basically pleaded my case to BMW first then the dealer. BMW then communicated with dealer on what if anything can be done to offset my cost. BMW in the end probably asked the dealer to help a BMW customer that has had other BMWs. So in short we got the valve cover gasket replaced and the oil line repaired for $1200 and a loaner for a week. We were out of warranty for 4 months for the oil line and as you know no real warranty for valve cover gasket leak. My experience is once the BMW starts leaking its going to find the next weak point in the system then leak again. This is my wife’s choice I drive a GMC truck otherwise I would have traded it. Does this intentionally leave out the N26 due to a different design or is it assumed N20/N26 are interchangeable? There is a recall on some N26 on the same turbo oil line. I can’t thank you enough. I just brought the car into the dealership and I think having this bulletin definitely helped. 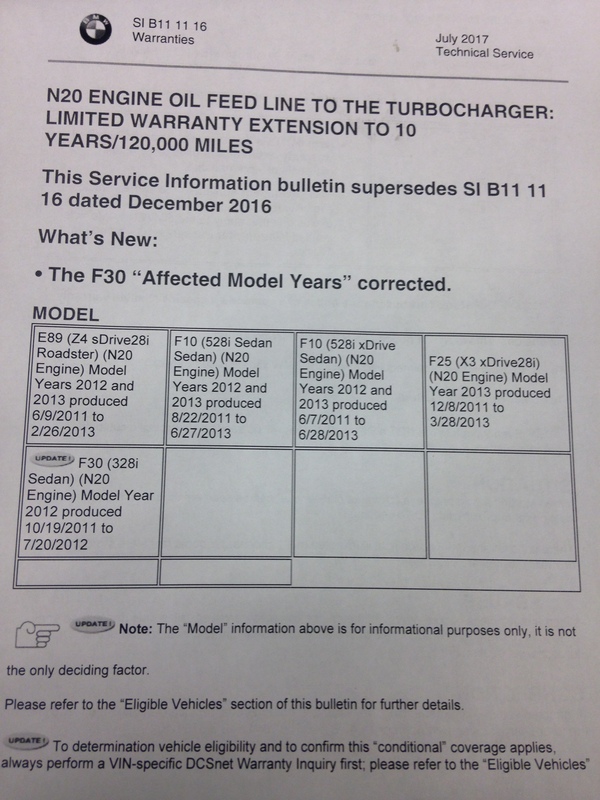 They are replacing my ’12 328i oil feed line under warranty even though the rest of the car is out of warranty. Hello BMWtechician! I am looking for a car for my mom, I’m thinking about buying a 2014 320i California version for her. Any problems with these car? Reliable? I want it to last at least 130,000 miles trouble free. Any input would be helpful thanks! I don’t plan on buying the extended warranty. What would you say are some of the issues that make you worry? Working at a dealer we mostly see low mileage cars,,,,,usually once they get to 50k mile we don’t see them again,,,,,,so I personal don’t know what happens after that,,,,,I don’t know what problems you might have. Do you see any problems at all before 50k? My 2013 X3 is throwing that white smoke at start up specially when it sits for a long time. According to the Vin # it was produced in 2012 so this bulletin should cover it. If i take it in to the dealership how would they tell if the problem is the turbo or the oil feed line? it looks like this bulletin only covers the oil feed line or does it cover the turbo as well? If they come back saying it’s the turbo, is there a way i can tell them to replace the oil feed line only (for free)? You have mentioned in another post that its about 50% chance is the oil feed line, i just done want them to tell me its the turbo($$$$) when it could very well be the oil feed line(free). I had a ECU tune in 2012 that was apparently noted by BMW. So when I was at the dealer recently, they denied my replacement of the oil feed line due to this modification. Is there any way I can win this argument? Obviously, BMW put out a faulty oil feed line design and I believe this problem (white smoke in exhaust) would’ve popped up even without an ECU tune. I think I’m right, but just want your feedback. I really appreciate the info here. I was able to understand the issue better… Service advisor did a really poor job explaining the issue to me. That’s what I’ll try next. Hopefully it works. Any tips to help swing the decision in my favor? Thanks! Also, should I have someone inspect the turbo to determine if there has been any damage from the feed oil leak? I thought I read somewhere that the leak would only cause reduced catalyst life. But in another thread I read that it could cause damage. They can check the turbo when they replace the oil feed line because the turbo has to be removed anyway,,,,but you should be fine with the turbo,,,,you would have problems if there was no oil then you have a big problem. Just one question (for the ones who suffered the problem or you Andreas when you observed it): does the white smoke apppears even if car remains completely idle during the first (let’s say) 30 seconds after startup? I am asking because in my case i can observe that if car is started and no movement happens with it, only very few smoke appears. But this does no smell to oil but also does not appear to be clean steam. It s like steam which smells to smoke (something like when a car starts with rich mixture). If just stsrt and i move the car in the first 30 secs then the amount of smoke is bigger..so it s something strange cause does not look oil smoke but neither clean steam… Someone has experienced that? May it be the issue of oil line at the very beginning of the issue?? Sounds like the start of the turbo oil feed line starting to go. a) if the oil moves fom engine to the exhaust side due to carbonized sealed ring, why is not happening also when engine is normally running? Should not appear a continuous smoke plume when car is driving? or in other words, why only when engine is stopped? b) If they mention “due to sealing ring carbonization”, Should not be the sealing ring that should be replaced and not the oil feed pipeline? b) The “check valve” in the new pipe, seems to correct the problem. But as i could see, it prevents the oil to be moved from the engine area to the turbo. But isn’t is this the natural way of the oil whn engin runs? (i.e. from the engine to the turbo). It would be logical for me that this situation of “preventing return to turbo” would happen in the “turbo oil return” -from turbo back to engine- pipe but what it puzzles me is the fact that it’s mentioned in the “turbo feed line” -from engine to turbo-. I have this doubt, unless my misunderstanding is related to the naming convention of the “feed” and “return” line which do the opposite way as i believe. My 3 series 2013 BMW just hit 55K miles and started showing the white smoke at start up. I took it to the dealer and they said it was the turbo line and ran my VIN and said it wasn’t under recall, so it would cost me $2000 to replace. But it there was a recall for this very thing on other 3 series made at the same time, so surely it means that there must be a problem on this too? Who should I call to make this happen? Thanks for your reply, I made an appointment at another garage that works only on BMWs but isn’t a BMW dealership for a second opinion. I am also trying to research everything there is to know about how the feed line to the turbo works, how the oil leak happens and how many other 2013 3 series BMWs are having the same problem (it seems quite a few). What happens when the car shuts off and sits over night oil drains from the engine from this oil feed line and sits inside the turbo,,,,so when you start it up in the morning there is to much oil in the turbo and you get that smoke in the morning until it burns off,,,,the new oil line has a check valve built in to it so the oil does not drain back in to the turbo. Ah ok, so this problem will not lead to other problems then? Minor issue? I have a 2012 F10 520i which has been showing “drivetrain malfunction” error for some time now. I have brought it to the dealership and they attempted to fix the issue about 3 times so far but I am still getting the same error. It happens when I press on the pedal “normally” however, if I press on pedal too hard, it doesnt show. If I turn emgine off and then on again, it goes away. I have recently noticed the white smoke if I switch on after 12 or so hours of being parked. My car is out of warranty and has 146,000 KMS on it. The smoke coming out the exhaust because of the turbo oil feed line does not cause the drivetrain malfunction light to come on,,,your drivetrain malfunction light is caused by something else,,,,on the turbo oil feed line I don’t think the dealer will fix it for free. After taking the car in 3 times already for the “drivetrain malfunction” and paying around $2K to get it fixed – which still to this day, its not!! SA told me last resort would be to replace the turbo which could cost me around $4K. Do you think this is reasonable? Any advice from your side? Do you no what this can be? And how urgent is it to have it checked out. The car was running as normal the hole time and the message was gone after restart. Hi, thanks for your answer. I have order a new pressure valve i hope it solves the problem. It was not a very expensiv part. I start my vacation just in time for the world cup, first game monday against south korea. I have this exact issue on a 2012 328i… Drivetrain Malfunction, error code 120308. Besides the turbo pressure valve and checking the various vacuum hoses for leaks, anything else to check? There also a pressure valve on the turbo,,,,it is located behind the wastegate you might see a small electrical connector behind the wastegate and that’s a pressure valve. It did not help to change the pressure sensor on my car, even switching to the new vacum hoses down to the turbo without it helping. After a number of troubleshooting with my BMW dealer, they have now come to the conclusion that they have to change turbo. Hopefully, this expense is also taken by my insurance company. What is strange is that the car has gone as usual all the time, except for the error message in the display. My N20 X1 2012 turbo is damaged like crazy and BMW never did this recall. Do you think bad turbo oil lines couldve done that kind of damage To my turbo? Thanks for your time. how long does it take to replace turbo oil line? how long does it take to replace thermostat?